Vince Velasquez's friends in California started to call him "Vinny from Philly" the moment the Phillies acquired him in December. Phillies fans will treat Velasquez as one of their own if he keeps pitching like he did Thursday afternoon in a historic performance in the Phillies' 3-0 victory over the Padres at Citizens Bank Park. Velasquez, 23, allowed three hits and struck out a career-high 16 in nine scoreless innings. He has struck out 25 in 15 scoreless innings in the first two starts of his Phillies career. "My face doesn't show it, but it was fun," Velasquez said. "I'm fully excited. Man, gosh, it's still hitting me." The strikeouts are the most by a pitcher in his first two Phillies starts since at least 1913. Hall of Fame right-hander Jim Bunning held the previous record with 20 in 1964. 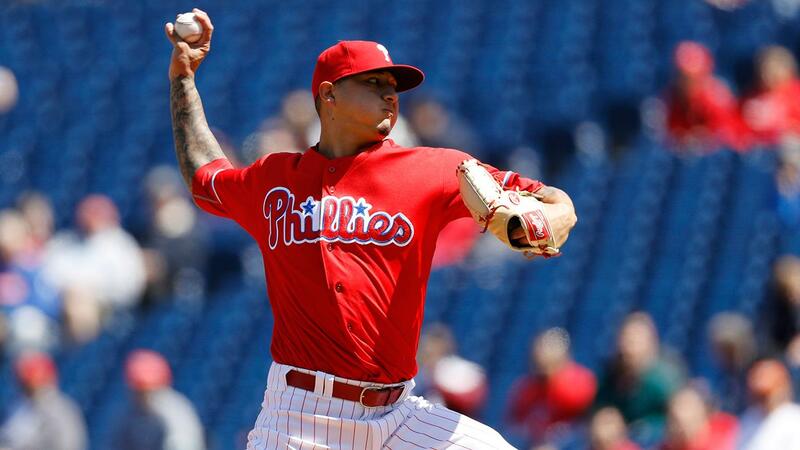 Velasquez, who joined the Phillies as part of the Ken Giles trade with Houston, also becomes the seventh pitcher in history to throw a shutout with at least 16 Ks and zero walks; Roger Clemens achieved the feat twice. "It looks like we made a pretty good trade," Phillies manager Pete Mackanin said. Padres left-hander Drew Pomeranz allowed two runs in six innings, including a solo homer and a sacrifice fly to Ryan Howard in the second and sixth, respectively. His eight strikeouts tied a career high, but the performance went for naught, as the Padres were shut out for the fifth time in their first 10 games, an MLB record. "It has a lot to do with who's on the mound, but it has a lot more to do with the level with which we choose to compete every single day," said Padres manager Andy Green. "Regardless of how difficult it is, we've got to be more competitive." Vinny from Philly: It is just two starts, but the Phillies love what they have seen so far from Velasquez. He struck out nine in six scoreless innings in his Phillies debut Saturday against the Mets. He followed that with an even better performance Thursday. He is the third youngest pitcher (23 years, 312 days) in Phillies history to strike out 14 or more batters in a game. Art Mahaffey (22 years, 323 days) struck out 17 against the Cubs on April 23, 1961, and Cole Hamels (23 years, 115 days) struck out 15 in Cincinnati on April 21, 2007. "It was a great day today," Velasquez said. "Everything was just kind of clicking." Down, looking: The Padres' best chance to score against Velasquez came in the bottom of the second inning, when Jabari Blash and Alexi Amarista reached on back-to-back singles. But Velasquez painted the inside corner with a fastball to Alexei Ramirez, who went down looking to end the threat. Big Piece delivers: Howard isn't supposed to play against lefties, but a shoulder injury toDarin Ruf had him in the lineup again Thursday. Howard took advantage of the opportunity. He hit a solo home run to left-center field in the first inning and hit a sacrifice fly to center in the sixth inning to give the Phillies a two-run lead. No help for the rotation: The Padres have now scored one run in their past three games, spoiling three very good starts from what's considered the "back-end" of their rotation.Robbie Erlin, Colin Rea and Pomeranz combined to allow four earned runs in 19 innings, but between them, they went 0-3 in those starts. "[Run support] doesn't really affect our goal out there," Pomeranz said. "Our goal is to give up no runs. It gives our team the best chance to win. For me, it's not walking the leadoff guy [in the sixth] and making the bad pitch to Howard. Those were the only two things I really could've done better to give our team a better chance to win." The Phillies have pitched three shutouts in their first 10 games for the first time since 1954, when Curt Simmons, Murry Dickson and Robin Roberts threw shutouts. Velasquez started two of the three shutouts this season. Charlie Morton started the other Tuesday night. The team record in 10 games is four. The Phillies accomplished that in 1913 with Tom Seaton (twice), Ad Brennan and Pete Alexander. Velasquez's 15 scoreless innings to begin his Phillies career is the longest streak by a Phillies starter since Marty Bystrom threw 19 scoreless innings in 1980. Padres: James Shields takes the hill Friday night as the Padres face the D-backs and look to snap a three-game skid. It's a reunion of sorts for Padres manager Andy Green, who spent seven seasons as a player in the D-backs' organization and three seasons as a Minor League manager. Green coached third base for Arizona last season before accepting the Padres job in October. Phillies: The Phillies open a three-game series Friday night against the Nationals at Citizens Bank Park. Phillies right-hander Jeremy Hellickson (1-0, 1.54 ERA) opens the series against right-hander Joe Ross (1-0, 1.29 ERA).